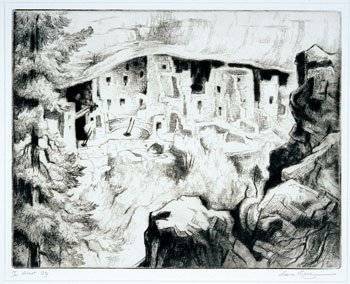 This is a great drypoint etching of pueblos around Taos, New Mexico by noted southwestern artist Gene Kloss. It is strongly composed with the structures occupying the center of the image. The buildings are framed by a pine tree on the left and a dramatic rock formation on the right. It is a classic image of the American southwest. Gene Kloss (Born Alice Geneva Glasier 1903-1996) began her artistic career in California, but moved to New Mexico after her honeymoon in Taos. She spent the rest of her creative life there. She was a prolific painter and etcher. She created over 600 etchings and aquatints. Many of these depicted the lives and ceremonies of the Pueblo people that she got to know so well. She was a long-time respected member of the Taos Society of Artists, and was the first woman elected to full membership in the National Academy of Design. Her work is held by virtually every important museum in the United States. She is one of the major printmakers of the 20th Century. The print is archivally framed and matted. It is in pristine condition, although it has not been examined out of the frame.